addresses how all change and Creative Self Expression is birthed from with-IN us. When ‘The Shape-Shifting Giant of the Heavens’ takes Lyria by the hand to teach her ‘The Secret of Bubble Art,’ she connects to her Destiny. When she sees that the Giant’s Big Toe is the Earth, where is the Splinter creating all of the chaos? Before Lyria can complete Master Kyoto’s earth mission, she must solve ‘The Puzzle to LIFE,’ and in doing so, is escorted through the ethers to a place on earth called, Earthgate. Through Master Kyoto’s guidance in ‘The Light Bulb in her Mind,” along with fulfilling his mission, in her Dream-time she travels with a group of Orbs from the Milky Way to locate the splinter in the Shape-Shifting Giant’s BIG TOE (the Earth), and discovers ‘The Key’ for dislodging any splinter of chaos on the earth. quoteBEing in Creation” is a multilayered soul odyssey out of time with a voice for every age. In the guise of a children’s fantasy she takes us on a whimsical cosmic journey addressing every human issue and all the big questions; an epic dreamscape on paper. Very original, this book is engaging and an effusively thought provoking read framed in Lyria’s travels, of giants and star beings, toes and paint `bubbles’, and should well become a timeless classic. 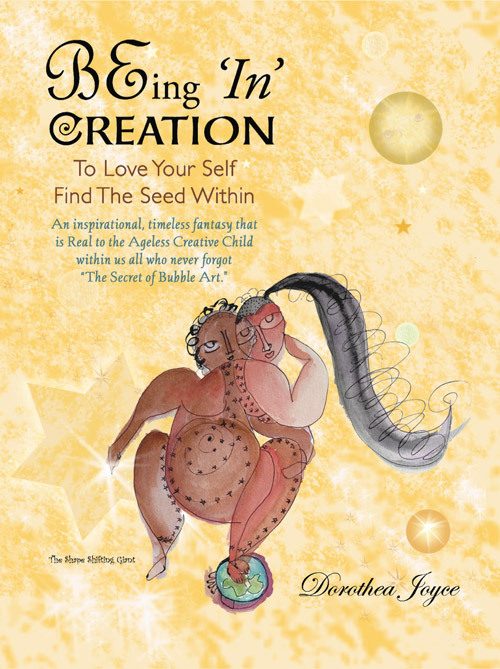 a joyful fantasy for anyone seeking to know where to tap into their creativity within. Dorothea’s real poetic gift lies in conveying, simply, the profoundest truths, such as how to travel within to find yourself. Dorothea’s creative use of art as a metaphor is both charming and whimsical, with deeper meanings in the symbolic use of language. quoteDorothea masterfully conveys a depth of understanding of this sacred journey that we share in these human bodies, ever merging mind and heart, as she weaves threads of profound truth and wisdom throughout this brilliantly creative and imaginative story.